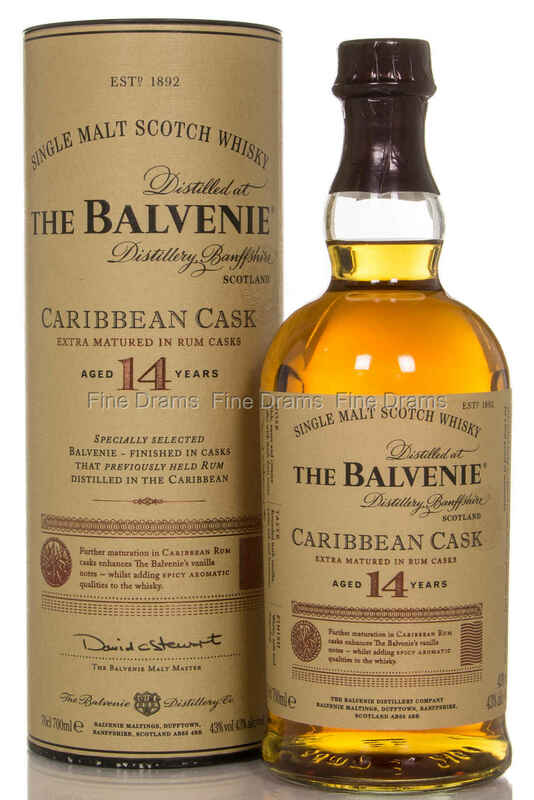 The Balvenie 14 Caribbean cask is matured in traditional American oak casks for 14 years, and then finished in ex-Caribbean rum casks. To create the ideal conditions for finishing this whisky, Malt Master David Stewart filled American oak casks with his personal blend of select West Indian rums. When he deemed that the cask was ready, the 14 year old spirit was transferred in to the rum seasoned wood, and laid to rest for as long as it would take to get the influence just right. The end result is a stunning mix of the delicate classic Balvenie Honey and Vanilla, mixed with sweet molasses and spice from the rum finish. Nose: Very rum like- lots of vanilla, foam bananas, and estery molasses notes. Some apples and pears, and warm hay. Palate: Hay, Apple and pear come to the fore, with molasses and bananas taking back seat. Though vanilla and esters are a powerful presence, with some slight wax. Finish: Medium with dry sharp apples and hay, slight milk chocolate. Overall: A perfect rum drinkers dram, a lot of molasses and estery character. Keeps its typical Balvenie honey and apples though. Lovely whisky.